Sheraton Grande Walkerhill presents a night in Seoul's designated spot of the season! 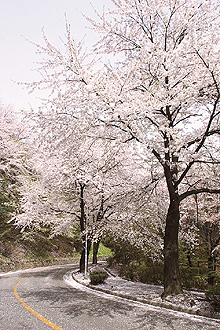 Walkerhill's Spring Avenue Package offers a relaxing and therapeutic experience amidst the blooming of cherry blossoms on Ah-cha Mt. The Spring Avenue Package comes with the Douglas Room of the annex or the Deluxe Room in the main part, and one option of your choice. Options include breakfast buffet at The View for two, two choices from the Cherry Blossom Festival menu, or tickets to the Walkerhill musical for two. The package comes with the great opportunity to enjoy the '2007 Cherry Blossom festival: SAN 21' during your stay at Sheraton Grande Walkerhill. The festival, starting March 31st, will run until May 8th, 2007. The path which runs along Sheraton Grande Walkerhill Hotel from Pizza Hill Restaurant has been designated by the city as "Seoul's Flower Path of Spring." Taking place on this Flower Path will be a Cherry Blossom Photography Contest, a Children's Cherry Blossom Drawing Contest, the World Wine Expo, as well as an opportunity to taste Walkerhill's very own chef's menu at the outdoor Cafeteria. Among the featured pieces, there are figures such as famous Korean actresses Lee Young-ae and Lee Kyung-ryul. Observing these photographs is a perfect experience for a spring day out in the sun, under flourishing cherry blossom trees. The second annual Children's Cherry Blossom Drawing Contest will be held April 7 ~ 29, 2007. All children with at least five years of age until elementary school may participate at no cost. A total of ten drawings will be selected for an opportunity to win a prize as well as an exhibition. Capture a romantic moment with loved ones under the cherry blossom trees. Participants may submit the photograph as an attachment by email, or by sending the URL in the body of the email. A total of four photographs will be chosen for a prize and an exhibition. A live jazz performance will be held every Saturday on Walkerhill's Cherry Blossom Row. The sound of a piano, saxophone, contrabass, drums, and a smooth, jazzy vocal will top off the night with a romantic ambiance. The Wine Expo takes place on the corner of Cherry Blossom Row. The expo has on display various types of wine from all over the world. Guests can taste approximately 100 different types of wine as well as purchase bottles that suit their preferences in the Wine Garage Sale. Wine Tasting at the Wine Expo will be \10,000 to participate. ※ Rain will result in an extension by one day. Alongside the Han River, atop the Acha Mountain, the cherry blossoms call for the 'Garden Barbeque Party.' Walkerhill's very own chef will be preparing the best of A La Carte meals. After the sun has set, and the stars reflect off the river, fireworks will start to make dinner more enjoyable than ever. To top the icing with a cherry, the soothing voice of a Park Kang-sung will also accompany the evening. Walkerhill invites everyone to enjoy culture and nature merging into an irresistible harmony at the Garden BBQ Party. For pet lover's the most poised and most elegant of dogs will join at Walkerhill's Dog Show, taking place during the Cherry Blossom Festival. Judges from around the world will come together to judge this contest to crown the Dog King and Dog Queen. All participants will be awarded with Purina dog food and various other souvenirs. Quizzes, fetching, poise, and running contests will be given to the dogs to give the Cherry Blossom audience a assortment of entertainment. Daily promotions have been prepared to suit the needs of a diverse range of people. For a girls' night out, the 'Lady Set' is available with complimentary dessert on Mondays, for a night of family bonding, the 'Family Set' comes with a complimentary children's spaghetti on Tuesdays, and for a romantic evening with a loved one, the 'Couple Set Menu' comes with complimentary beverages or cocktails on Wednesdays. There is also a dinner set for groups. For those people who need stress relief from work, a 'Company Banquet Set' is available on Thursdays with complimentary beer straight from the tap.